USC? Are we talking about the same team that still had a chance to lose to a Big 10 team in the closing minutes of a home bowl game? You West Coast guys should wake up a little earlier next year and watch a real conference in action where teams actually play offense and defense. SEC! SEC! SEC! SEC! SEC! Max...we *must* have been watching different games. That statement makes zero sense. 4th quarter of the rose bowl, USC was in "Let's not embarrass Joe Paterno...he's a nice guy" mode. That game was *never* in doubt. SC would have been a much better opponent for Florida than OK was. Is that what those horrid Tim Tebow interceptions were? Nothin' like hitting a 300 pound defensive tackle between the 9 and the 3! Gerald 'the real' McCoy! Keeeeyaaaaw! In terms of fandom, of course I'm sad. I really would have like to see this team go all the way and its disappointing to lose at the end after the tumultuous road that got us here. Both teams played good games. What was telling to me was the drives before the half where OU dominated with a quick pace and running attack (or as a friend called it at the time "He can run it, run it"). To see those end with glorious penetration and defensive stands in short yardage situations (The Clapp train failed a couple times) was dissapointing. It was a good game. To be honest, it is the best situation possible for an OU loss for me. Not blown out, a good game, but does raise the BCS issue as everyone desires, although Texas's play did not help that much. SC would have been a much better opponent for Florida than OK was. The game was close. Real close into the 4th late. It was a good matchup. I can see USC's argument for being shagrinned here, but that statement does not sit well with me, even after a loss. And we prefer OU. Notice how that's whats on the uniforms, etc. Boogle, I have to retract what I said, and the spirit with which I said it. You're right...OU was a fair matchup for Florida. Either one of those teams could have won the game. Nothin' like hitting a 300 pound defensive tackle on a well coached defense dropping into coverage on a zone blitz the QB didn't pick up between the 9 and the 3! Tebow had 340 total yards 2 TDs, Harvin had 150+ total yards with 1 TD, and nine different guys had touches? That isn't offense? OU were no cupcakes. USC wouldn't have known what to do against either team outside of Pasadena. Hats off to Stoopsy and the coaches at OU who had their team prepared. Oh and that was Tebow's FIRST multiple interception game of his career! How many multiple INT games did Sanchez have this year (two I checked [three picks against ASU? really? 10 for the year in a weak conference? (Tebow had TWO all year until tonight)])? And last I checked even though he threw two of the worst passes I've ever seen him throw Tebow still won a hard fought game against the (disputed) champion from every pundits' conference du jour at a semi-neutral site. Too bad every school doesn't get to "dominate" a school from a conference on the decline in a bowl game in their home stadium. And for the record PSU beat OSUw who beat USC who beat PSU and UF beat OU who beat TTU who beat UT but lost to Ole Miss who beat UF. Which proves absolutely nothing. How I see it it should now be Utah and UF playing for the title, but life is not fair and SEC/East Coast bias prevails once again this year. edit: Fanatka yeah I think I was a little foggy there on my recollection. I blame Old Grand-Dad, the coach formerly known as JoePa, and my combined hatred of USC and PSU. I was still thinking about how an actual coach would have called the 4th quarter for PSU and not how it transpired in reality. Everyone keeps saying USC, but I have seen NOTHING that would indicate to me USC would have scored more than 14 points against either of those two defenses last night (if they played at the same level). USC's defense is spectacular -- for the teams they played, but the Big 12 Offenses were spectacular until this Bowl Season. I think against either Florida or Oklahoma, USC is another good team, and the game would have been a coin toss in the 4th quarter. Just like last night. Maxox, those were 'QB INTs'. Straight up reads(McCoy) and looking dead at the receiver(Harris). In my opinion, you could put Sam's down on recievers to some extent. [i]Iglesias's hand off to [b]Black was particularly bad. Oh and that was Tebow's FIRST multiple interception game of his career! How many multiple INT games did Sanchez have this year (two I checked [three picks against ASU? really? 10 for the year in a weak conference? (Tebow had TWO all year until tonight)])? Yeah, the "Tebow didn't ever throw INTs when playing against SEC teams, but the minute he isn't, he's hitting D-linemen in the numbers" argument really doesn't help your SEC stance any. How did I know as soon as I heard the guy's name last night that someone would make this mistake? And you are looking at the worst quarter of one player's career as a counter argument against a whole conference? Tebow's throws were bone headed, but ultimately he came back in the 2nd half and made the big plays when called upon to do so. You are also taking things that a very very drunk person in party mode wrote way too seriously (I even wrote a disclaimer). Maybe the SEC is overrated? 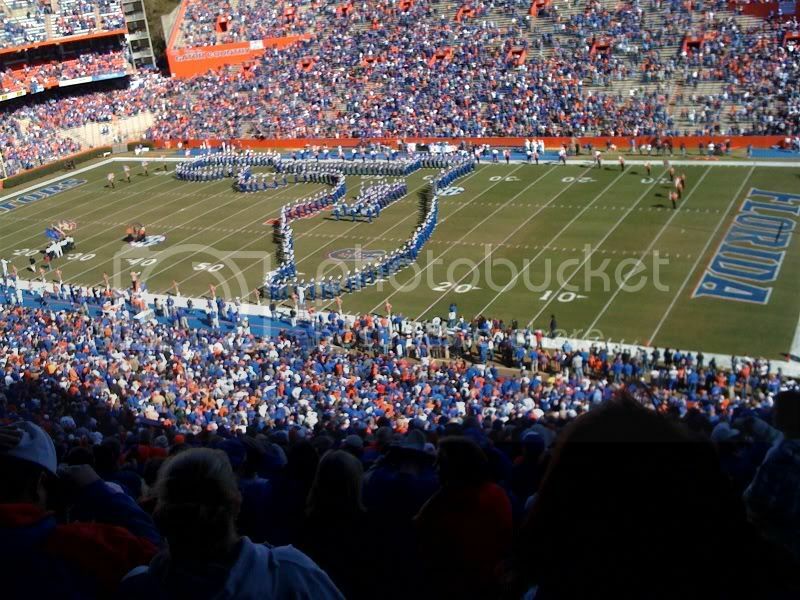 But to try to rain on UF's parade after they beat the #1 team in the country in their last two games is silly. boogle - I don't really disagree with you about Bradford's 2nd pick as Black pulled the ball out of the receiver's hands on the that one, but Haden tipped the first one and by the time the receiver could get his bearings there were three guys in white shirts swarming the ball. Hopefully Bradford and OU build on this. As long as Stoopsy is at OU they will be a team I want to see do well. Baby Mangino is your Deadspin Sports Human of the Year. Oh, and apparently Tim Tebow putting off proving whether or not he can hack it in the NFL for another year, but who really cares? The baby won! Now if only more fans did something like this (NSFW video) to celebrate their teams winning championships, I wouldn't care who won. Wait no news about Erin Andrew's FSU educated sister?? In actual news ... Bradford, Gresham, Williams, and McCoy are coming back for the Sooners. And you are looking at the worst quarter of one player's career as a counter argument against a whole conference? I'm trying to point out how baseless and counter-productive arguing teams "by conference" is. You're not getting it. So far, the "arguments" you've made against the idea of USC being the better team have consisted nearly entirely of name-dropping conferences. *Legion*, do you actually have an argument for USC being #1? I haven't seen you present any kind of USC is #1 argument. It just seems from your last post that you just wanted to tell me I was an idiot (edit: oh you edited so it isn't as nasty sounding)? Anyway UF had the #2 SoS. They beat six Top 25 teams and beat the #1 team in country twice in their last two games. UF beat #1 and then 12-0 "holy crap they're good" (full strength) 'Bama and #1 "best scoring offense evar" OU in back to back games. What did USC do by comparison? Since losing to OSU they beat #23 Oregon at home then #21 Cal at home. In their bowl game they beat #8 Penn State. After losing to Ole Miss (who also ended up being a pretty decent team in the end like OSU) by one at home UF beat #4 LSU at home, beat #6 UGA at a neutral site, beat #25 USC(arolina) at home, beat #20 FSU at their hostile dump of a stadium, beat #1 'Bama at a neutral site, and #1 OU at a neutral site. UF not only made up for their loss, but they ended their run against the best. USC's SoS was #38 btw.